What can I use it with ? Can I use it with a VGA card ? Will it work with my TV ... ? What will the picture look like ? How is it hooked up ? Does the unit convert in the other direction ( NTSC Video into RGB ) ? Will it change the screen size, location or rotate the picture ? Are there any known problems ? What exactly is it.. ? This device is designed to take the Red, Green, Blue and synchronization signals from an video arcade game board and convert them into a NTSC video signal. This means you can use the video encoder to convert video output from an arcade game PCB and display it on a regular TV set, which has video or S-Video input. What can I use it with.. ? The converter can be used with a wide variety of game boards, testing has being carried out on a large selection of games to ensure compatibility. 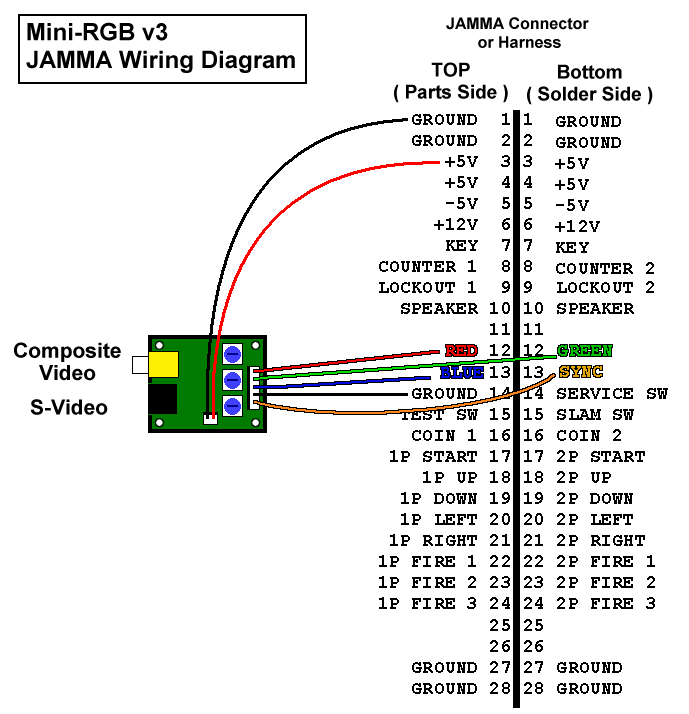 Almost any standard resolution JAMMA game will work with the encoder. HOWEVER as variations in video & sync. output vary greatly across game boards not every game can be guaranteed to work with the encoder. For example - Nintendo games such as popeye, donkey kong, Mario Bros all use inverted video - these require a separate video inverter to work correctly. Typically these signals are available on a standard resolution JAMMA gameboard. The vast majority of JAMMA games of the 1980's and 1990's are standard resolution and should work without problem. Can I use it with a VGA, EGA or Medium Resolution signals ? No, the unit requires a standard resolution video signal with 15kHz Horizontal synchronization. VGA resolutions are of 31kHz or higher line rate and EGA/Medium res of 25kHz line rate, the unit DOES NOT convert VGA frequency signals. It is NOT compatible with VGA/ EGA or Medium Resolution video signals it is strictly Standard Resolution only ! Will it work with my TV ? The TV MUST have either composite Video input or a S-Video input. The converter will not plug into an antenna socket ( the screw on RCA jack ). For best possible picture quality please use S-Video connections. This is totally dependant on which output from the converter that you use and the TV set used. Composite NTSC video is of SIGNIFICANTLY lower quality than a dedicated RGB monitor, so do not expect the quality of the output to rival what can be achieved with an RGB monitor. S-Video picture is of a much higher quality than composite video, it easily rivals what can be attained with a dedicated monitor. However even this format is not identical to a dedicated monitor. Compared to composite, an S-Video picture is much sharper and lacks artifacts such as 'dot crawl*' ! It's strongly advised for best possible picture quality use S-Video outputs. How do I hook it up ? BE EXTREMELY CAREFUL WHEN CONNECTING THE CONVERTER !!! ALWAYS check wiring and voltages BEFORE connecting, mis-wiring of the converter or the game power supply can damage or destroy the converter, the gameboard and the TV. Do Not guess when making wiring connections or with voltages !!! NOTE: The video synchronization signal into the converter is designed to a combined ( composite ) Horizontal and Vertical negative sync. It does not support separate Horizontal and Vertical sync. signals. No, the converter will only convert RGB video into NTSC video, it will not work in reverse and convert an NTSC video image into component RGB. No ! There is no additional processing carried out on the image. There are no adjustments for picture size or the location of the image on screen. If these need to be changed, because the image does not fit the TV screen, then the TV set needs to be adjusted. The converter has NO controls over these settings. Some games feature a vertical screen orientation, e.g. pacman, where the game is designed to run with a monitor which has been rotated 90 degrees ( the monitor is orientated so it is on it's side ). The converter does not rotate the screen, so that you can display vertical games on a horizontal display. Are there any known problems. ? The only known problems are with later Midway games such as Smash TV, NBA JAM, Mortal Komat ( 1, 2 & 3 ) . These games use a vertical sync. frequency of around 56Hz ( the majority of games having a vertical sync of around 60Hz ). This vertical sync. frequency appears to be incompatible with some Sony TV sets, most notably the Sony WEGA series. These sets cannot sync to this frequency and the picture will roll vertically. This is NOT a problem with the output from the converter is it purely a problem with the TV receiver. Do you provide the schematics, parts list or bill-of-materials for the encoder ? No, schematics & part lists are not available.